Howdy, howdy from the cornfields of Kansas! Let’s take a break from the holiday hustle, shall we? 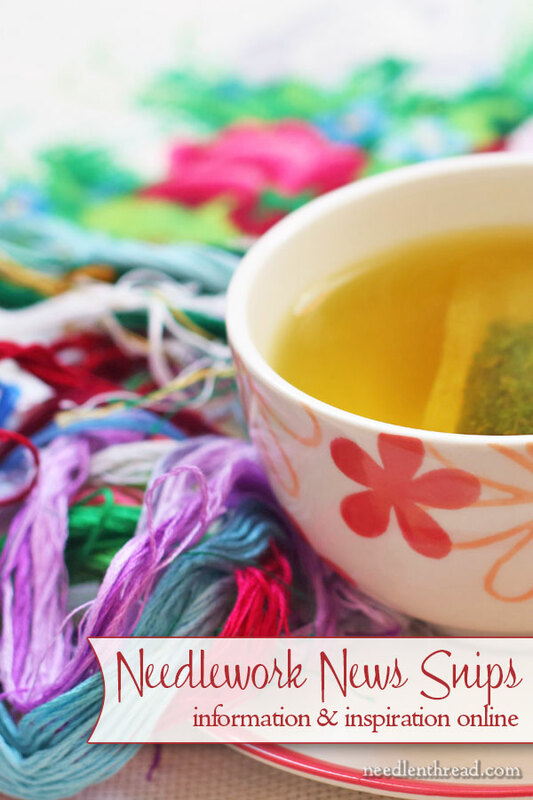 Grab a nice cup of something, and let’s explore some embroidery-related bits that have caught my eye in the past week or so. Some are informational, some are inspirational, but I hope all are enjoyable! Tanja Berlin’s two-sided holly embroidery project: Tanja’s offering a beautiful embroidery project on her website, for free. It’s double-sided embroidery, so both sides can be displayed. Patterns and instructions are all there, waiting for you! Over at Lyn’s Needlecase you’ll find a very nice collection of free holiday fonts referenced – some are lettering, some are little graphics. Did you know you can use computer fonts for embroidered text? Just print the words the size you want them, trace them, and stitch away! There are some pretty fonts in the collection that would work well for embroidery. Some inspiration: over at Crazy by Design, Cathy shows us her progress on a crazy quilt piece made from a wedding gown. Nice! And what a great idea for preserving memories! And speaking of crazy quilting (and considering it’ll be 60 degrees in Kansas today and it feels more like spring), you can get a taste of spring by visiting Allie’s In Stitches and seeing the finish on her fantastic crazy quilt masterpiece, My Secret Garden. Just check out the sky in that piece! And the flowers! And the bird! What a piece of art! If you browse through the blog, you’ll find more articles on its development, too. If you love costuming, folk embroidery, and cultural studies, you’ll enjoy the blog Folk Costume & Embroidery. The most recent article on the costumes and embroidery of Valsesia in Italy is not to be missed! The pristine white needlelace on the shirts! The colored needlelace and embroidery! Wow! Can’t get enough on embroidery thread? If you’re looking for something to read about threads in general, and about choosing them to add texture and dimension to your embroidery projects, you might enjoy my article “Helpful Guide to the Best Threads for Embroidery” over on Craftsy, where I talk about the most common embroidery threads and how they’re different. Feel free to ask any questions or leave comments there, too, if you want – I check in now and then to see if anything needs answering. Speaking of threads, over on Sew Mama Sew there’s a really good article on How to Choose Your Thread. It’s not really about embroidery thread in particular – it’s about sewing threads. If you do any sewing or quilting or anything like that, it’s good information about choosing the right thread for the project. And while we’re on the fringe of embroidery-related stuff, this is a nice article over on All About Paper – it’s a round-up of kits of Christmas ornaments made with paper. At the end of the article, there’s a darling embroidered card, too! Now, the reason it caught my eye is this: the little white paper houses at the beginning of the article are so pristine, so perfect. They’re great as they are – but they’d work well for embellishing, too! Oh, this whitework and needlelace sampler on Jeanny’s Merklapperie is so pretty! She’s on Block 28, but if you browse through the whole blog, the other parts are highlighted, too, and well worth looking at. For lovers of canvas work, you’ll find a nice little needlepoint freebie on the Colour Complements blog. Fun! Well, that does it for today! Have a wonderful weekend. Take some time to relax and put a few stitches in your current project! A very interesting read with lots of information on different ways to create Christmas ornaments. I love Tanja Berlin’s free Holly embroidery project it looks an easy project to follow. Your guide to best threads for embroidery is also very enlightening. All the craft websites are interesting and a great read. Thanks for sharing your weekend snips with us and for all the useful information contained in them. I hope you have a great weekend. Thank you for the bits of information today. – Folk Costumes — They are so bright and happy. It must have done wonders for people to dress up and celebrate especially after struggling so often day after day. – Puncetto — One of my favorites with the simplicity of design that can transform a garment into something special. I am trying to practice this as often as I can. – Other regions — The Sami people in the North to the Kashubian region of Poland (a favorite embroidery) and on. Simple things to make a day something brighter. Thank you Mary – I always love visiting the places you come up with! So many interesting links, Mary! I especially love the Christmas fonts and think they would translate well into quilled lettering… now there’s a project for me for [next] year. 🙂 Thanks very much for including the ornament kit round up. I love your idea of adding stitching to those dear little houses.